Scrambles: it's what's for breakfast. 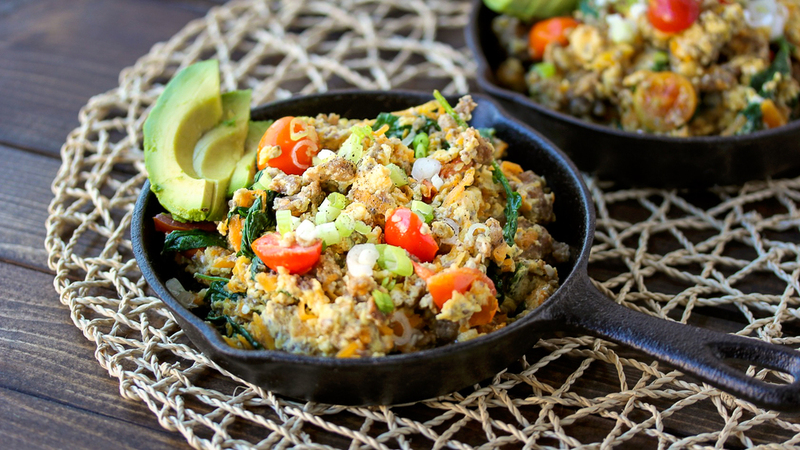 Here’s a really easy breakfast scramble inspired by this breakfast skillet. It’s a good one to have in your arsenal and after doing it once or twice, can probably be done in your sleep. Although it’s best to get your yolks raw, sometimes scrambled eggs sound so delicious. Add in a complex carb source like sweet potato/squash (go for carrots if you are low-carbing it) and even chia seeds for fiber — eggs are a great way to hide them — and you’ve got a complete meal. I love to cook my eggs on low until they are just barely set. You end up with a super creamy bite that is worlds away from dry, overcooked eggs. Cooking them on low is also better for all those delicate nutrients in the yolk. Breakfast sausage (<–sugar free, as it should be! ), some hearty greens, and pile on the fats from a ripe avocado. Your body will thank you and your hunger will be held at bay until well after lunch. In a cast iron pan or nonstick skillet, cook the meat over medium heat until brown and crumbled. Add the shredded carrot/squash and the greens and cook until wilted, about 3 minutes. Add the cherry tomatoes and stir to warm them, about 30 seconds. Turn the heat to medium low and add the eggs. Stir gently until eggs are just set. Season with sea salt and pepper and top with garnishes, as desired. *For high fiber alternative: mix 2 Tbsp. chia seeds with 1 Tbsp. filtered water in with the eggs before adding to the pan.